Sitting at a woeful “1.8” out of 10 on IMDb (with 12,000 + votes cast), it was inevitable we’d turn our eyes to the heavens and examine the notorious Birdemic. Not to be mistaken for The Birds, the Hitch masterpiece by which this poop was allegedly inspired, Birdemic (full title, Birdemic: Shock and Terror) is widely regarded by aficionados of terrible cinema as one of the worst films of all time. This quirky “independent romantic horror film” was written, directed, and produced by James Nguyen, an auteur of the awful a la Ed Wood. 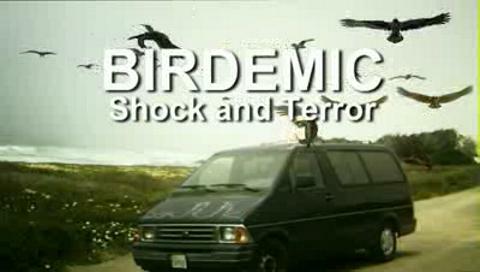 The somnambulist performances, uneven sound, memorably inane exposition and some of the weirder special effects you’ll ever encounter, makes Birdemic can’t miss material. It’s strangely hypnotic and so bad, it actually improves a bit with repeated viewings (but take that with a grain of salt: we’re rigorous defenders of Battlefield Earth). What really makes this one a cut above (or is that below?) is the green-think Mother Earth moralizing. Al Gore, eat your heart out! (but make sure that heart is locally-sourced).